Steve cleaned and sealed our concrete patio and pool deck, and did a superb job. He was friendly, punctual, fast, and the quality of his work was superb. All for a reasonable price. Thanks Steve! You're the best! Thanks Aaron for the great review. When we fully renovated our home 2 years ago, we had the furnace and duct-work completely removed and nothing but electrical in-floor heating installed for heating our home. Unfortunately this resulted in electrical bills much higher than we had anticipated, so we had Canada Furnace do a retrofit install of a new gas furnace and associated duct work to take advantage of the lower heating costs associated with gas heating. They did a superb job. Although our situation was quite unique, the design and layout they created was truly optimal and well thought out. The quality of their work was very good, and the people we dealt with (Robin, Marcus and Ryan) were very knowledgeable and easy-going. They were fast (done in 3 days) and very responsive to all our concerns and requests. These guys are top notch. Quality work at a reasonable price. Adco Pools built a custom free-form concrete pool and hot tub for us, and we are absolutely delighted with the workmanship, service and quality of the final product. Fernando clearly takes great personal pride in the pools he builds and ensures the job is done right. His crew was hardworking, knowledgeable and a pleasure to deal with. Fernando was very responsive to all of the issues and concerns that we raised throughout the project, addressing all of them eventually. He was a little slow in following up with some of the small details that needed his attention towards the end, but he eventually came through on all of them once his schedule allowed him time to do so. His pricing was very good - approx. 30% less than the other contractor we were considering. The pool equipment he recommended (pumps, heaters, etc.) is top-notch and has worked exceptionally well so far. The finished product is simply gorgeous to look at every day and we are so grateful to Fernando and his team. Thanks Guys! 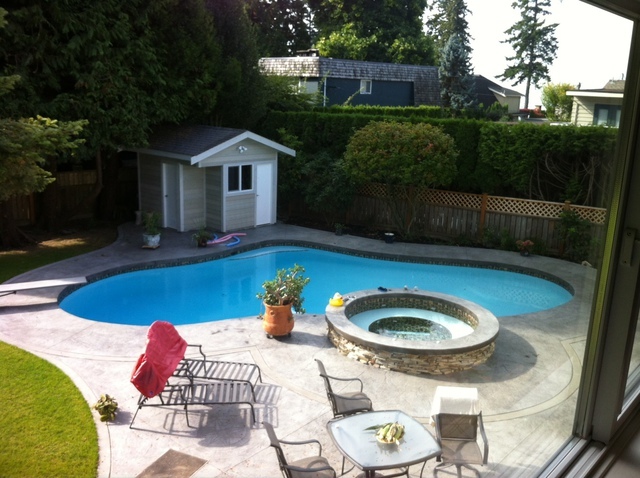 We would recommend Adco Pools to anyone interested in building a concrete pool. UPDATE 1 YEAR LATER: Part of Adco's installation included a solar heating system installed on the roof of our house, which, after 1 year, we are very dissatisfied with. It was designed in such a way that it does not provide any significant heating to our pool due to an inability to get sufficient flow through it and under-sized heating panels. It was a complete waste of money, with no hope of ever earning back our investment in it. After doing some research of my own, I believe a different design with a different brand of panels could provide much more efficient solar heating. Fernando has been unresponsive to our email and voice mail messages on this. I do not recommend Adco for solar heating design. The rest of the pool and hot tub system we are still very happy with though. We did a complete (right down to the studs) renovation of a 45 year old house, Although we did most of the demo ourselves, EA Renovations did the rest of the reno, and they were fantastic. Mark, the GC on our project, was exceptional - a very kind, easy-going and level-headed man with incredibly good design ideas and a firm grasp on the practical aspects of getting the job done right. We interviewed 6 contractors before selecting EA Renovations, and we have no regrets whatsoever. He was honest and trustworthy, and the quality of his crew's workmanship was superb. We also found that the tradespeople Mark brought in for the job were of the same level of integrity, and all kind people who worked very hard and took great pride in their work. Mark was also extremely responsive to even the smallest of our concerns, and addressed them immediately. The project was completed in 6 months, as promised up front. We are so happy with the end result - we just love our new home and we have Mark and his skilled crew of tradespeople to thank. Our only complaint would be that the project was substantially over budget. Some of that was our fault because of extra features we added along the way, but a large part stemmed from Mark's low initial estimate. We went cost plus on this job, but if we were to do it again we would go fixed price instead to avoid this situation. In the end, we were very happy with the finished product, and we don't mind paying extra for quality workmanship. We would indeed recommend Mark and his crew to anyone doing a home reno of any kind. Thanks for the great review Aaron! happy to be working with you again! MetroWest was fantastic. The two electricians that worked on our whole-home renovation over the course of several months were friendly, easy to work with, reliable, and did quality work. They re-wired our entire home and pool shed, and were very responsive to all our needs and concerns. I'd recommend them to anyone! Thanks Dave & Jon!! !